This past weekend we celebrated our 3 year anniversary. Andrew did all the work, really. The weekend was his idea and he planned everything; it was marvelous! It was jam-packed with awesomeness and I couldn’t think of a greater way to celebrate our anniversary! Friday morning, we packed up the car, dropped the pup off at boarding, and hit the road. Andrew told me we were driving towards Harrisburg to get to our campsite for the night. We pulled into Cowans Gap State Park (Pennsylvania). If you’ve never been, you should check it out. There are a lot of campsites that are pushed together, but the park is big, there’s a huge lake in the middle of it, and they offer kayaking/canoeing, hiking, and there’s even a beach! We set up camp at one of their 7 walk-in sites. We were off for about another 1.5 hour drive to our Friday night activity, so we didn’t have a ton of time to lounge around but we were able to take a nice little walk and snap a few photos. 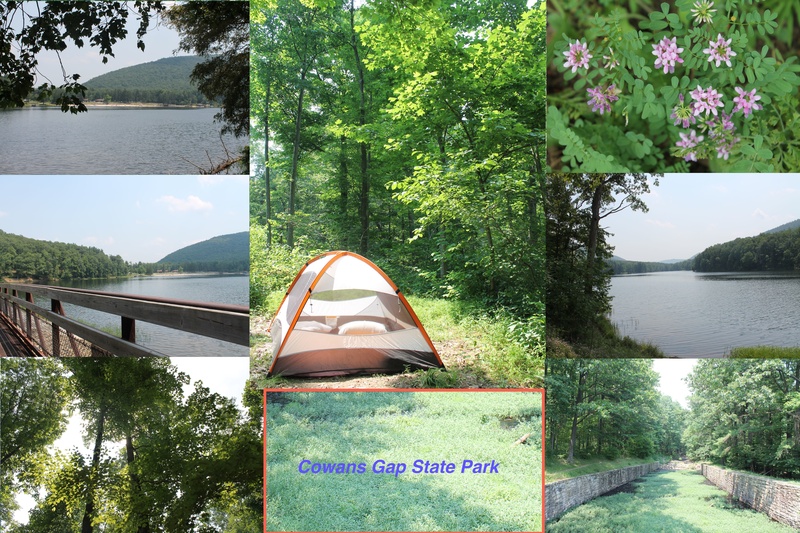 Cowans Gap State Park: Really Cool! So, we headed off to Hershey Park by way of Harrisburg. We used to Yelp! to find a delicious and local Mexican Restaurant- we found good reviews for a Tres Hermanos; a Mexican restaurant that doubled with a Mexican grocery store. The food was delicious and authentic. Good job, yelp! 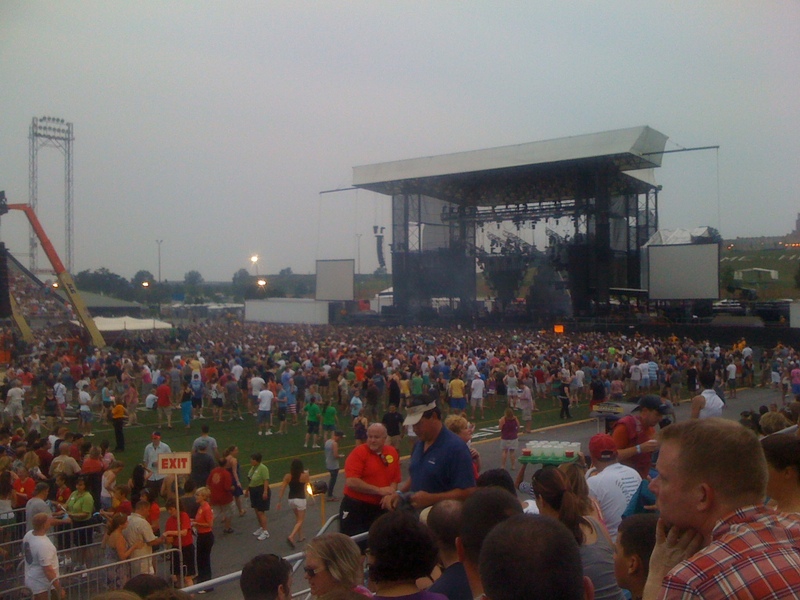 Next we were off to Hershey Park Stadium for… DAVE MATTHEWS BAND! We’ve seen him at Bonnaroo but we haven’t attended one of his concerts together yet, so this was great. Plus, Hershey Park Stadium is fantastic! The set list was amazing, the weather was toasty, and the atmosphere was laid back. Towards the end of the show, we watched the lightening storm roll in and around us- kind of scary. 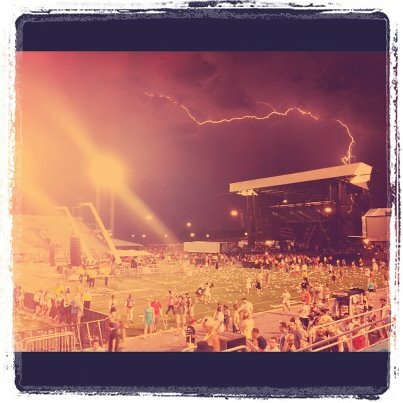 We were really lucky to not have any lightening hit closer to the stadium, although this picture we grabbed after the encore makes it seems like the lightening hit the stage! As you might imagine, Friday was a late night. By the time we got out of the stadium parking lot is around 1:30AM. We knew that our camping gear would be soaked through because we stubbornly didn’t put the rain fly on because it was so hot and there was no call for rain. Exhausted, we pulled into a rest stop and slept in the car from 1:45AM until about 4:00AM. At that point, we headed back to the campsite, packed up our gear, saw the sunrise, and headed west to get to our Saturday morning adventure! Stay tuned for Part II of Epic Flagaversary Weekend!